Whenever someone mentions the Russian basketball team (or anything else Russian for that matter), one person comes to mind. 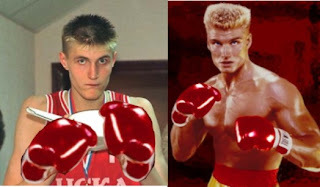 Ivan Drago. Apparently Ivan and the rest of the Russian basketball team have won Eurobasket! (like Yahoo!). While the other European countries like Spain and Songaila practiced by scrimmaging and running plays, the Russians were training a different way. Russia practiced against robot players (like Lebronny 5), programmed with the attributes of Dream Team I. They used a specially designed 20 lb Apple I-Ball to build & monitor strength, and they constantly were hooked up to science machines to maximize their bodies. They even had a diet specifically calculated by the world's smartest computer (the diet turned out to be 42). I Win For Me!!!!!! FOR ME!!!!!! The results are clearly visible in the above picture. Before, Andrei Kirilenko was tiny and ate soup all day long. After months of scientific training, the results speak for themselves. He is now the most perfectly trained athlete ever. And now they have great confidence going into the Olympics. Hopefully, the US Basketball team will finally get serious and start training in the alps. Then maybe they won't be such a disappointment. This Is The Greatest Montage Ever!